Experts and political scientists comment on the intention of the president of Kyrgyzstan to close the NATO airbase. Here is an interview with Ajdar Kurtov, an expert with the Russian Institute of Strategic Studies. Ferghana.Ru: Some experts refuse to believe that Manas AF Base will be closed. What do you think? Ajdar Kurtov: I think that the Marxist axiom that practice is the only criterion of truth is absolutely correct. I never accept anything on the strength of promises alone until these promises are kept. Particularly when the matter concerns the head of the Kyrgyz Republic. Kurmanbek Bakiyev made a similar promise three years ago but never kept it. Moreover, it was not to the president of Russia that he was promising it. The promise was made to the heads of the Shanghai Cooperation Organization. There are other reasons to be suspicious as well. So far as I know, it was only recently that Kyrgyz state structures signed an agreement with the Americans concerning maintenance of some objects Manas AF Base couldn't function without. I do not think that these agreements were just a ruse, simply a device invented to milk the Americans. Nor do I think that the agreements were signed because political decision-makers were taking so long. In any event, execution of the decision will take time too. All legal procedures should be observed, the parliament should be consulted. There are technical aspects of the problem as well. Bishkek cannot just tell the Americans to get the hell out of Manas and kick them out. The Americans need time to bring their activity to a halt, time to transfer their assets elsewhere. I'd say the whole process will probably take months, not even weeks. Who can say what may happen in the interim? Unfortunately, Russia's partners in the Commonwealth - I mean the Asian republics - cannot help being crafty. It's part of their mentality. They do not even notice it. All of them regard their system of values as the only possible one. Ferghana.Ru: You deny malicious intent on Bishkek's part to milk the Americans. And yet, if they fail to shut the base down, it is Russia that will have been milked, right? So far as I understand, the decision to close the base is part of the package agreement. Bishkek has the Americans shut down the base and withdraw in return for loans and grants from Russia. Ajdar Kurtov: Let us draw a line between chops and flies as Vladimir Putin once so aptly put. Yes, sum total of the finances Russia promises Kyrgyzstan looks impressive ($2 billion). On the other hand, credits account for a substantial part of this whole sum, which means that the money will be invested now to make a profit at some later date. Kyrgyz state debt amounting to $180 million is to be chalked off but only in return for Dastan, an enterprise of the erstwhile military-industrial complex of the late Soviet Union. This is where things get interesting. I'd like to know why should Russia bother? Why does Russia want it? Cannot the Russian military-industrial complex do without this factory? I doubt it. Particularly since real worth of the enterprise in question is quite problematic because lots of specialists left Kyrgyzstan. I do not think that this enterprise may recover and become what it was in the Soviet era. Moreover, I have reasons to believe that the Russians initially had wanted a larger interest in the enterprise than what they ended up with. And what they ended up with (48%) is below what is called the controlling interest. In any event, some monies are to be made available to Kyrgyzstan on unbelievably charitable terms - at an extremely low interest rate and for 40 years. Forty! Who could imagine 40 years ago what truly tectonic shifts would occur in what then was the USSR? Who can say now what it will be like in another 40-year period? Odds are, five years from now or even sooner the Kyrgyz leadership will once again appeal to Russia to restructure the debt or chalk it off at least partially. Moscow is constantly badgered with these requests: how come you chalk off the debts of Mongolia, Afghanistan, or Algeria and not ours? Aren't we allies? This integrationist policy Russia has been promoting in the post-Soviet zone and regarding as normal actually costs Moscow the sky. Cannot say I accept all values of this policy. It is wrong I believe to make too much of an emphasis on absolute equality between allies. Try as I might, I cannot conceive of equality of economic potentials of Russia, a colossal economic power, and Kyrgyzstan notoriously short of resources for being truly independent, both politically and economically. It's best to center these relations around common goals and objectives, ones that are genuinely aspired to in joint projects and not just declared. What we see in real life should be the only criterion of effectiveness of any organization or sincerity of statements politicians make. Ferghana.Ru: What do you make of the following chain of events: Russia insists on Manas shutdown, Kyrgyzstan seems ready to comply, and Moscow and Bishkek immediately proclaim readiness to continue cooperation with NATO forces assigned to Afghanistan? 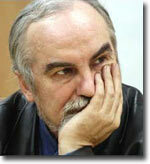 Ajdar Kurtov: I disagree with this term "insists". Let us consider Manas AF Base from the standpoint of Russian interests and Russian defense capacity. Is this base such a pain in the neck? Does it pose any threat of Apocalyptic proportions? Are there silos with strategic missiles there? No. This is but a logistics support base which shouldn't concern Russia any more than it does to Kyrgyzstan or Kazakhstan. The way I see it, it is first and foremost the Kyrgyz leadership itself that should be interested in continued existence of the base because the base is a factor of security and not because of any fiscal considerations. I do not think that it was Russia that put Bishkek under pressure to oust the American military base in return for a financial gain. Ferghana.Ru: Are you saying that the decision was Bishkek's own and nobody else's? Ajdar Kurtov: What with the crisis tightening its grip, the Kyrgyzes went to Russia for economic aid. Since there is preciously little they could offer Moscow in return, the matter of the base surfaced almost on its own. That's what I think happened. As for the connection with Russia and its attitude toward the counter-terrorism coalition... I'd say that Russia really wants as many neighbors of Afghanistan as possible to be involved in the effort to solve the Afghani problem. Not one of them is involved in political processes at this point - neither Iran nor China, Uzbekistan, Turkmenistan, Tajikistan, or Pakistan. It is only the Americans and their allies that are involved. Ferghana.Ru: Wait a second. Let's go over it again. If Russia does not object to existence of the American military base in Kyrgyzstan, why all this fuss then? I was under the impression that it was Russia leaning on Bishkek to order the Americans out. And if NATO needs this base for the purposes of its operation in Afghanistan, then where is this cooperation with the Alliance readiness for which Moscow and Bishkek proclaimed? Ajdar Kurtov: I'm not saying that this base is of truly vital importance. Counter-terrorism operation demands colossal and constant funding, that's the principal problem. Railroad transit is enormously cheaper than transit by the air. Russia does not even object. Russia offers its territory to NATO. As a matter of fact, there are other potential routes to Afghanistan - across the Caspian region, Caucasus, or via Uzbekistan. On the other hand, our deeply ingrained Soviet habits compel us to suspect - and not unreasonably - that this military base may eventually come to pose a threat to domestic stability of our potential allies in Central Asia. After all, it is not as if the Alliance were eager to meet Russia halfway. Its deeds collide with its words. The Alliance approaches Russian borders wherever possible - in Europe, in the Caucasus, and in Central Asia. This is probably why Russia decided that it would be better off without this base. Kyrgyzstan: Is President Kurmanbek Bakiyev trading the US Army for Russian dollars?